Who wouldn’t want to take home a film of the Arc de Triomphe or the Louvre seen from above. With its multiple monuments, Paris is a very attractive destination for drone pilots. Unfortunately, what is supposed to be an unforgettable souvenir sometimes actually becomes one for a different reason, when the amateur drone pilot gets arrested and prosecuted for breaching the very strict French drone laws. The French drone laws have been reinforced regularly since the use of drones for leisure purpose has developed. Since then, French Civil Aviation General Direction (DGAC) communicates extensively on the main provisions regulating the use of nonprofessional drones. “It is punishable by six months of imprisonment and a 15 000 € fine the fact for a remote pilot to, by clumsiness or negligence, fly over an area of the French territory in violation of a prohibition pronounced under the conditions provided for in the first paragraph of Article L. 6211-4 with an aircraft circulating without any person on board. Not to comply with the requirements of Article L. 6211-4. A map of the French no-fly zones has been published and a set of strict rules has been enforced in zones where flying a drone is allowed. Under the current drone laws PARIS HAS BEEN CLASSIFIED AS A NO-FLY ZONE. This means that it is no allowed to fly a drone in any place in Paris (either public or private). This rule exists as much to protect the public from the risk represented by falling drones as for security concerns regarding the use of drones as potential weapons. Currently, drone laws are enforced rather toughly on tourists caught flying a drone in Paris and it is not rare that police arrest and detain in custody anyone, tourist or not, caught flying a drone in touristy areas. Most of the time, the drone pilot will be reminded the ban imposed on drones use in Paris. If the drone pilot has been caught in a sensitive place, like a crowded area, he may be arrested and detained for a couple of hours for questioning at a police station. Transferred to the correctional court for immediate judgment. In case of an arrest or prosecution, it is strongly recommended to seek the assistance of an attorney. 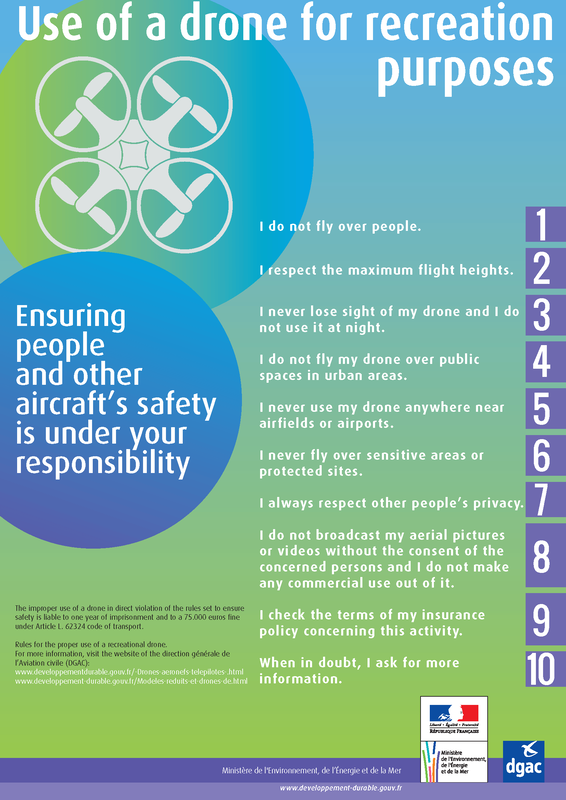 Observing the 10 basic rules advertised by the DGAC will keep drone pilots out of problems. We regularly represent and defend foreigners involved in drone infractions in order to ensure that they receive the necessary information about their rights. Our firm have represented and defended many tourists caught in breach of the French drone laws. In most of the cases we have obtained that the drone pilot be declared non-guilty, and the drone returned to him, arguing that he had no knowledge of the ban imposed on drones in Paris. We have however observed that French courts currently tend to be much more reluctant to let drone pilots go with a simple warning, considering that the French aviation authorities now communicate extensively on basic rules regulating the use of drones, including in English. If we have never heard of a tourist being incarcerated in France for a drone infraction, penalties like fines and confiscation of the device are much more common now than they used to be few years ago. All our lawyers are fluent in English. We assist clients all over the French territory.